We have Unzan Graham Ross taking up residency at the Black Mountain Zen Centre from October to November 2016. 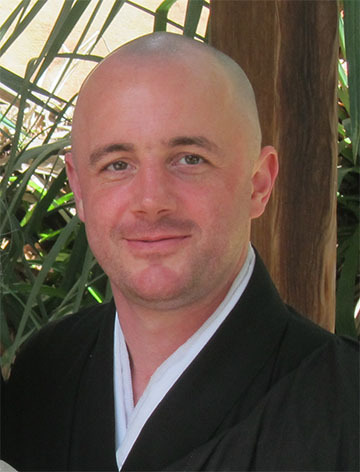 Graham is a Zen priest and teacher from San Francisco Zen Centre. Graham has been practicing Zen for over 15 years, including a nine year residency at Tassajara Zenshinji; the San Francisco Zen Centre Monastery. He is a senior student of our abiding teacher Ryushin Paul Haller. Graham will be offering a series of talks and workshops as well supporting the regular schedule and offering practice interviews. All schedule information below takes precedence over the standard weekly schedule. After the listing of the schedule there are further details on the content. It is an opportunity to see the teacher one and, one to discuss what’s going on for you and how you’re practicing with it. Available Tuesday’s – Friday’s between 8:45 am – 10:00 am. In this 9-part series we will explore the vitality that can manifest in our lives when our practice is grounded in confidence and enjoyment. To experience going beyond our limited views is the territory of zazen. Above are the 4 upcoming Saturday’s, when we will ‘Come Together for Meditation,’ and with an intention and ease, reconnect with our fulfilled and joyful heart.